The Savingfood platform offers a novel approach to tackle food waste, by turning this environmental issue into an innovative solution to fight hunger through the redistribution of surplus food to welfare organisations that support people in need. Moving forward from existing food redistribution channels SavingFood seeks to create a social movement for reducing food waste, by engaging all actors of the food waste cycle to become part of the solution. The project brings together the food waste community and the technical and scientific community in a mutually beneficial context to provide a complete, sustainable and flexible platform where all participants – food donors, beneficiaries, policy-makers and society at large – can engage, discuss and deliver within a prosocial environment in which everyone’s needs are met, information is shared and food is effectively distributed. 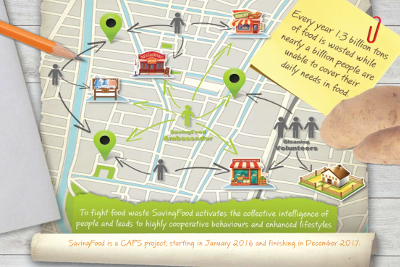 SavingFood is a Research and Innovation project funded by the EU in the framework of Horizon 2020 programme. ViLabs is a private research and innovation laboratory and provides a wide range of research, development and consulting services to national as well as international enterprises and organisations, utilising a unique set of tangible and intangible resources, including knowledge, facilities, human and financial resources, for supporting researchers and entrepreneurs to innovate. BOROUME, which means “we can” in Greek, is a non-profit organization committed to reducing food waste and the distribution of surplus food for charity throughout Greece. Since its beginning in 2011 more than 2,5 million meals of surplus food have been donated to welfare organizations. The Hungarian Foodbank Association is a non-profit organisation creating a link between food surplus and deprived persons. The main activity of the Foodbank is searching for food that cannot be commercialized for some reason, to organize the transportation, safe storage and distribution of the collected resources to people in need. The Foodbank distributes the collected surplus through charity organizations and governmental institutions who are in daily contact with the people in need. FILAB is a recently established organisation bringing together decades of professional experience in planning and implementing small- and large-scale innovation projects related to any kind of innovation aiming to empower innovation potential in co-creation, involvement of different stakeholders in the society. Feedback campaigns to end waste at every level of the food system by catalysing food waste movements around the world. We work with governments, businesses, NGOs, grassroots organisations and the public to change society’s attitude toward wasting food, campaigning to reduce waste throughout the food system – not just consumer level waste – and shining a light on the hidden causes of waste.